Join this first event in our Autumn series 'The Pliable Plane', bringing together leading designers, architects, curators and researchers to explore the influence of Bauhaus textile designer Anni Albers on architecture, and the use of 2D and 3D patterns in our built environment today. 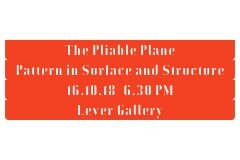 This season of events takes its name from Albers’ essay The Pliable Plane: Textiles in Architecture (1957) and draws on themes she explores of surface pattern and structure, flexibility and responsiveness of materials, and adaptability of a buildings programme. The Pliable Plane will delve into these themes through hands-on material workshops, discussions and guided tours taking place in London and Amsterdam. The beginnings of building, coincides with the beginnings of weaving, the intertwining of materials to “construct a whole from separate parts”. While it is an unlikely comparison that Albers makes between architecture and textiles, her writing and designs offer radical insights into the way’s we think of a buildings materiality and function, both internally and externally. Reflecting on Sto’s portfolio of façade materials through the eyes of Albers, the humble mesh literally ingrains the act of weaving into every insulation system globally, and allows for the design flexibility of curved or rounded planes as well as complex joint detailing. On the surface of the façade the more expressive finishes such as the Sto Signature and Ecoshapes range, also gain exciting new possibilities which we hope to explore throughout this series. This event series coincides with the Tate Modern’s first UK full-scale retrospective of Albers' work in London (11 Oct 2018 – 27 Jan 2019), and is also an opportunity to preview Lever Gallery’s new exhibition ‘Metropolis – Recent Paintings’ by Colin McCallum (16th October to 10 th November).